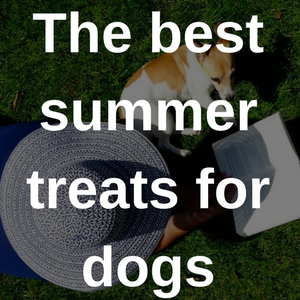 Summer is here, and what better way to spoil your dog than by giving him or her one of these fantastic summer pet treats we've found? You may use a Kong as a throw toy or to hide some tasty food in but have you ever through about freezing it for a nice cold summer treat? Kongs can be filled up with water, peanut butter or even wet dog food for a snack that lasts a little bit longer. This lets your dog use the teeth it was given in a productive way - much more exciting than simply eating from a bowl. Get yourself a classic red Kong from Zooplus here. Most dogs love playing fetch. The pet supplies retailer monster Monster knows this, and is offering a free tennis ball with any purchase of wet or dry food from Lily's Kitchen. Tennis balls are a classic toy all year round but are perfect while Wimbledon is on. Get your free ball by making a Lily's Kitchen purchase here. Pooches can get lonely too, so why not treat your dog to a doggy date? Borrow My Doggy is a service that lets people borrow each other's dogs for a short period, perfect for playdates. You simply make a profile as either a borrower or an owner and search for a dog. Then you meet the owner, the dogs can meet each other too, and if you hit it off you can borrow the other person's dog for a day, or let someone borrow yours. With longer days over summer it's a great time to take your dog and a new friend out for a walk after work or at the weekend. Social interaction is essential for dogs' mental health, as well as giving them someone to play with to get some exercise. If you're an owner, the website can also help you develop a support network in case you ever need anyone to look after your pooch. Find out more on the Borrow My Doggy website. It's important to remember that on hot days your dog will get particularly thirsty. It can be hard to find a way to properly quench your dog's thirst when you don't have a bowl with you. However, there is a solution - an expandable bowl. Beco offer a small travel bowl for £3.99 that can fit in your bag and expands so your dog never has to miss a meal while you're out. They're even dishwasher friendly, so they're easy to clean. Get yourself a Beco small travel bowl here. Planning on going away this summer but can't find anywhere for your pet to stay (or haven't found anyone on Borrow My Doggy)? Now, you can take your pet with you through the Eurotunnel. To take your dog, cat or ferret it costs £18 each way, and rabbits, rodents, fish and most birds go free. Staff are trained to help with pets and on there train there are dedicated exercise areas so you and your dog can stretch your legs. There are even complimentary dog waste bags. And, of course, guide and assistance dogs travel for free. Head to the Eurotunnel website for more information. If your dog is a fan of the water, why not get a paddling pool for them to splash around in the sun? It will allow your dog to cool off in the summer heat and you can don the Speedos and jump in too. You could even float some dog treats in the pool for double the fun. Get yourself a two-metre paddling pool for just £12.99 from The Range. As the weather improves, you might want to take your pet out for a hike or a run. The problem is, dogs' paws can get damaged if the ground is too hot. Scorching tarmac or sand can burn the pads on their paws, resulting in painful injuries. To combat this, Ruffwear has created the Ruffwear Summit Trex Dog Boots. These are boots that fit snugly on your pet's paws to protect them on hard or uneven surfaces. The boots allow fresh air to circulate while keeping out dirt and debris. The company offers a handy guide to measuring your pooch's paws, as it's important they fit and aren't uncomfortable or too big. Get some Ruffwear Summit Trex dog boots. Ice lollies aren't just for humans. There are both savoury and sweet 'pupsicles' you can make for your pooch to give them something to cool them off in the heat. Modern Dog Magazine suggests two recipes: a fruit pupsicles with banana, orange juice and plain yoghurt, and a savoury pupsicle made of chicken broth. You can try varying the juice you use, but make sure it doesn't have any added sugar in it. Also, it's probably best to make your pupsicles without sticks, as you don't want your pup eating them. The website does note that some people have said ice can cause bloating in dogs. However, the website says to only give your dog one pupsicle at a time, and there should be no problems. For more information on pupsicles, check out the Modern Dog Magazine website. Most dogs love snapping at bubbles. Unfortunately, some of the chemicals in supermarket bubble mixture can be harmful to dogs (not to mention children). But there is a way of making your own bubble mixture that's totally safe for dogs. The Honestly blog suggests using 2 tablespoons of Honest Dish Soap (recommended because it is plant-based and doesn't contain any harsh chemicals), 1 tablespoon of vegetable glycerin and 1 teaspoon of white sugar. The glycerin and sugar make the bubbles last longer, and this solution shouldn't cause your pup any problems if it snaps at the bubbles. You can even make your own bubble wands from pipe ceaners. Head to the Honest blog for the original article on non-toxic bubbles. The DogBuddy blog suggests another frozen treat you can make for your dog are peanut butter and jam 'toasts'. Mix some strained strawberries with water, top them with some peanut butter and freeze them. More fruity treats for your dog! For more information on frozen treats you can make for your dog, check out the DogBuddy blog. These frozen treats only require three ingredients: a couple of apples, some plain, unsweetened yoghurt and 2 tablespoons of Brewer's yeast. First, stir the yeast into the yoghurt and spoon the mixture into an ice cube tray. Then, dice your apples and press a piece into each section of the tray. Leave them overnight to freeze and you've made some healthy, frozen treats for your dog. Have a look on the Pawsh Magazine website for the full recipe. Learn about our unique pet insurance products by joining our pet insurance group.